The Hydro development started in the 1960s with building 3 major dams in the upstream section of the Sakarya River. During the 1980s the development of the floodplain sections of the river had its onset. Under these altered conditions Huso huso, Acipenser nudiventris, and Acipenser sturio disappeared from the river until the 1980s but Acipenser gueldenstaedtii, as well as Acipenser stellatus, were shown to still reproduce in the remaining section of the river by 2013. The construction of three additional HEPPs begun in the river section below Pamukova, blocking migration and cutting off major spawning sites. While fish passage facilities were included in the construction of the HEPPs since the 1980s, their design and location, as well as the maintenance rendered them completely dysfunctional. A survey was carried out in the remaining free flowing section of the lower river in 2014 to determine fish community composition and water quality at 4 stations below Adasu HEPP. While a few A. gueldenstaedtii juveniles were observed in Sakarya River mouth close to the Black Sea, only one young-of-the- (YOY) (A. stellatus; W:25g; TL:28cm) was reported which was captured from the Lower Sakarya River. Akmirza, A., Yardımcı R.E. (2014). Fish parasites of the Sakarya River, Turkey. 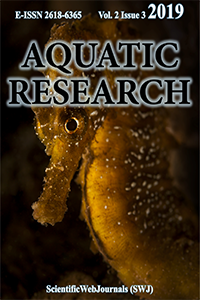 Journal of Academic Documents for Fisheries and Aquaculture, 1(1), 23-29. Anon (1992). General directorate of the state water, investigation of pollution aspects of Sakarya–Seyhan Basins and report of determination of quality classes of this basins, 5, General Directorate of the State Water, Ankara. Anon (2013). Preparation Project of Action Plan of River Basin Protection; Proposal Report of Sakarya River Basin. 5118601 (Çtüe.13.134). Türkiye Bilimsel Ve Teknolojik Araştırma Kurumu Marmara Araştırma Merkezi Çevre Enstitüsü. Temmuz, 2013 Gebze, Kocaeli. Anon (2018). Pan-European Action Plan For Sturgeon. Convention on the Conservation of European Wildlife and Natural Habitats. Standing Committee 38th Meeting Strasbourg, 27-30 November 2018. Document prepared by the World Sturgeon Conservation Society and WWF, Strasbourg, France. Arısoy, S. (1968). Fisheries in Sakarya (Sakarya vilayeti çevresinde su ürünleri ekonomisi ve kooperatiﬂesme ile kalkinma imkan ve problemleri). Istanbul University Economics Faculty Publication No: 1391, Istanbul, 182 p. 182. Brinkhurst R.O. (1963). A Guide for the Identification of British Aquatic Oligochaeta, Freshwater Biological Associaton Scientific Publication, 22:55. Buysse, D., Coeck, J., Maes, J. (2008). Potential re-establishment of diadromous fish species in the River Scheldt (Belgium). Hydrobiologia, 602(1), 155-159. Delage, N. (2015). Experimental study of environmental conditions effects (temperature, oxygen, pollutants) on survival, development and behaviour of European sturgeon, Acipenser sturio, embryo-larval stages (PhD Thesis). Bordeaux University, French. Doğan, E., Çeribaşı, G., Akkaya, U. (2016). Investigation for Effecting of Dam to River Flow Regime by Trend Analysis Method: Case Study of Sakarya River. Karaelmas Fen ve Mühendislik Dergisi, 6(1), 50-55. (In Turkish). DWA, (2014). Fischaufstiegsanlagen und fischpassierbare Bauwerke-Gestaltung, Bemessung, Qualitätssicherung., Mai, Hennef, Deutschland, 334 pp. Edwards, D., Doroshov, S. (1989). Sturgeon and Seatrout Fisheries Development, FAO, Turkey Technical Cooperations Programme. Appraisal of the Sturgeon and Seatrout Fisheries and Proposals for a Rehabilitation Programme, Rome, 35 pp. FAO, (2001). Fishing Gear types. Fyke nets. Technology Fact Sheets. Retrieved from http://www.fao.org/fishery/ (accessed 10.10.2013). Gümrükçüoğlu, M., Baştürk, O. (2007). Coğrafi bilgi sistemleri kullanılarak Sakarya nehri kirlilik yükünün belirlenmesi. In TMMOB Harita ve Kadastro Mühendisleri Odası Ulusal Coğrafi Bilgi Sistemleri Kongresi (pp. 1-5). Trabzon, Turkey. Işık, S., Şaşal, M., Doğan, E. (2006). Investigation on downstream effects of dams in the Sakarya River. Gazi University Journal of Engineering and Architecture, 21(3), 401-408. Official Gazette. (2004). Water Pollution and Control Regulations. Ministry of Environment and Urbanization, No: 25687, 31.12.2004. http://www.mevzuat.gov.tr (accessed 20 January 2018). Rosenthal, H., Gessner, J., Deniz, H.; Memiş, D., Ustaoğlu Tırıl, S., Zengin, M., and Altan, Ö. (2015). National Action Plan for the Conservation and Restoration of the Sturgeons of Turkey. (Edits: Rosenthal, H., Gessner, J), Ministry of Food, Agriculture and Livestock, Ankara. Saltabaş, L., Şaşal, M., Işık, S., Doğan, E. (2003). Examination of the current changes in the Lower Sakarya River. Sakarya Üniversitesi, Fen Bilimleri Enstitüsü Dergisi, 7(2), 9-15. Şengörür, B., İsa, D. (2001). Factor analysis of water quality observations in the Sakarya River. Turkish Journal of Engineering and Environmental Sciences, 25(5), 415-426. Tırıl Ustaoğlu, S., Memiş, D. (2018). An Overview of the Factors Affecting the Migration of Sturgeons in Yeşilırmak. Aquatic Sciences and Engineering, 33(4), 138-144.